We set up our basecamp at the lodge Rendez-vous, which is just beside the cableway station up to Oeschinen Lake. 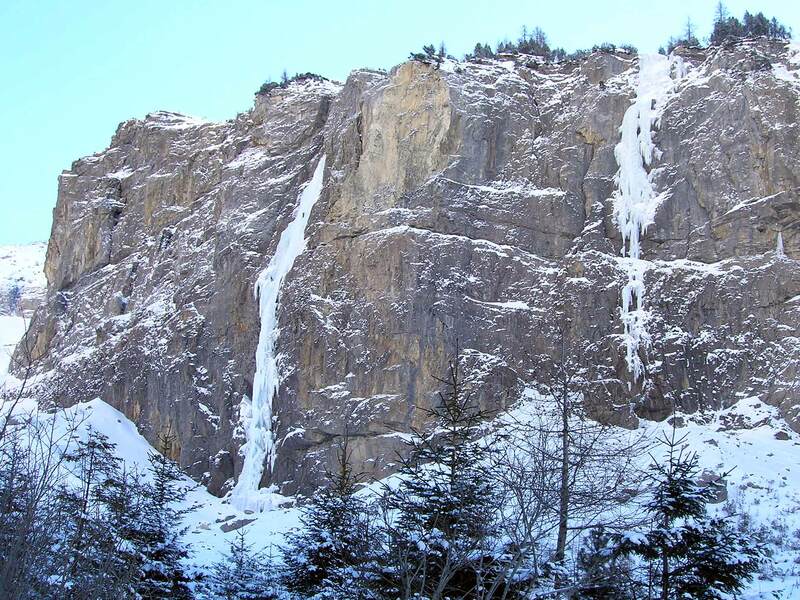 This is a great starting point to every icefall in the Kandersteg area. 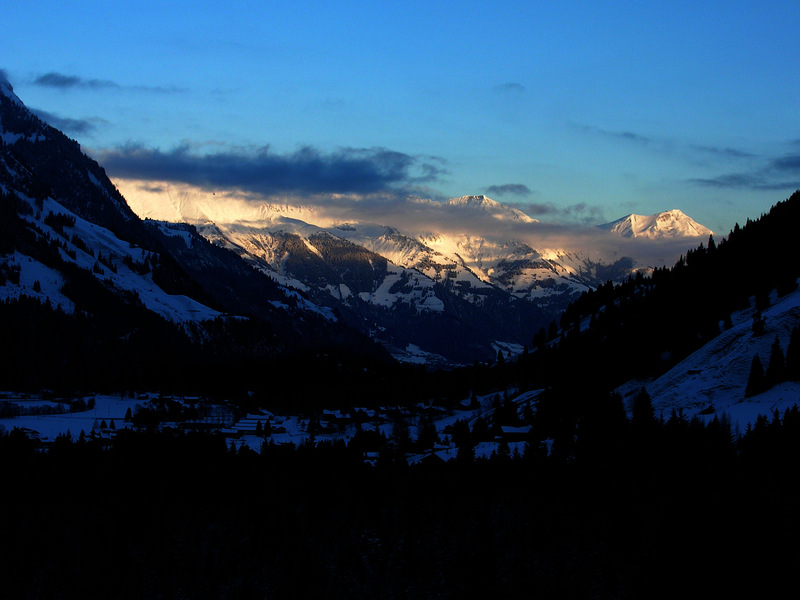 From the lodge you already see many frozen waterfalls – a bizarre beauty on time.  Accessing the Staubbach takes approx. 1 hour and you better start out early, because usually only one roped party can act in Rübezahl per day. This icefall, which clears its way over the cliff, is just too narrow and too dangerously, if one would climb under another roped party. It was a good idea to have breakfast one hour earlier as usual. We where lucky, because only five minutes after we arrived the starting point, another roped party from Sweden came by. 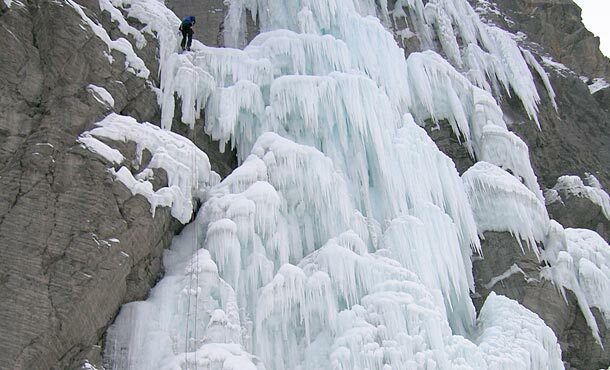 I’ve already started climbing, so the two showed consideration and went to another icefall. After the first climbing meters it becomes clear to me that we have perfect ice conditions today. I enjoy to work myself up to the first belay. 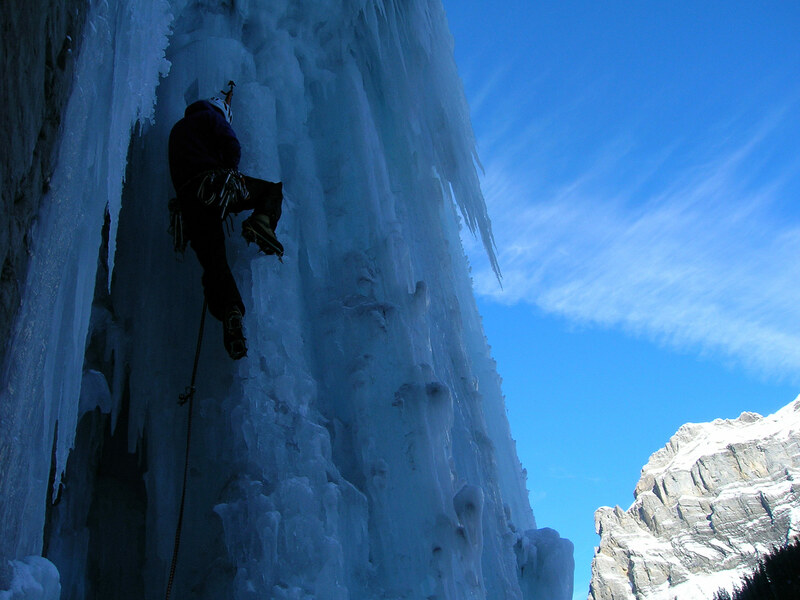 The end of this pitch was very hard – one has to climb in chickenwing style through a section of icicles. This needs filigrane climbing on overhanging ice structures. 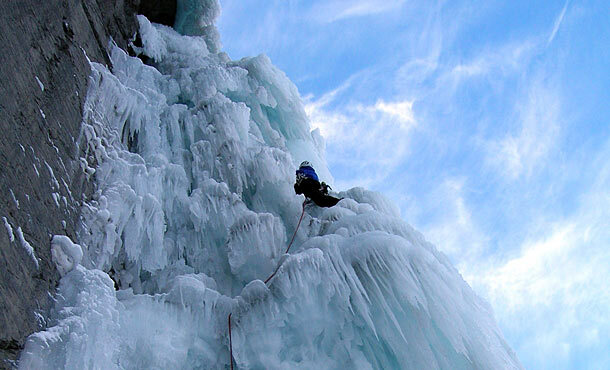 From there the route makes its way nearly perpendicularly through many icicles on the next two pitches. We climb higher while carefully hooking at cauliflower ice. The second belay lies well protected in an ice cave. 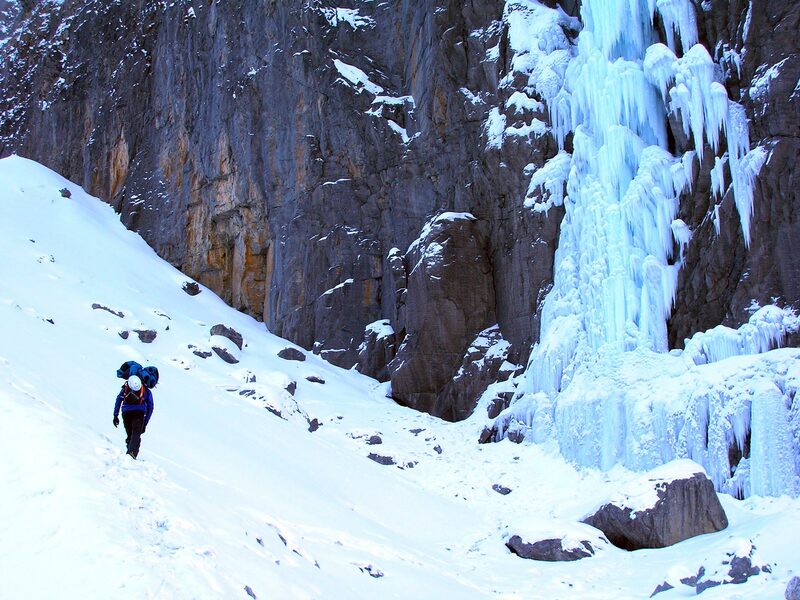 Every single pitch of the entire icefall is on the opposite side of its last one, so the belayer is never seriously exposed to the ice impact of the leader. On the fifth pitch I choped my ice axe so powerfully into the ice that I can’t pull it out any more. Laboriously I try to release the pick somehow by carefully rotating and pulling the ice axe. No way – the ice axe remains seized. Eight meters obove the last ice screw I carefully begin to pick the ice with the second ice axe away, trying not to fall. As I finally manage to pull out the ice axe, I climb on. After a few meters I can set the next ice screw for protection into better ice. My strain drops down rapidly. Now I have to continue climbing to the next belay. The upper pitches aren’t so steep anymore, but one still has to act highly concentrated and prudently. The Gully at the end is quite unspectacular – one is atop the icefall and asks oneself immediately, how to descent unhurt. But since the upper rappel anchors are in good condition, one can rope down easily. The final pitch is a tough one. 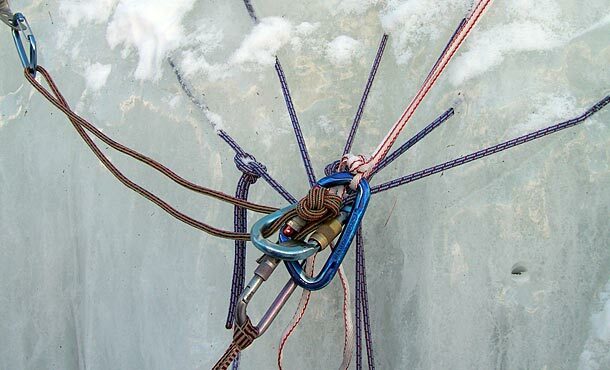 We rope down on an ice anker with a 5 mm belay rope, which runs through a selfmade Abalakov. And because of this overhanging pitch, one can’t relieve the belay rope with the feet. And as if this wouldn’t be enough, we rope down directly through an ice-cold waterfall, which squirts perpendicularly down on us. Like well known Reinhard Karl once said: “the tour isn’t finished until the beer stands on the table in front of one”.